I made this script because quite frequently in the past I had to reach for Photoshop or Mix color map just to find a value somewhere in-between two colors. This control offers more intuitive way of blending them and more control over the result. 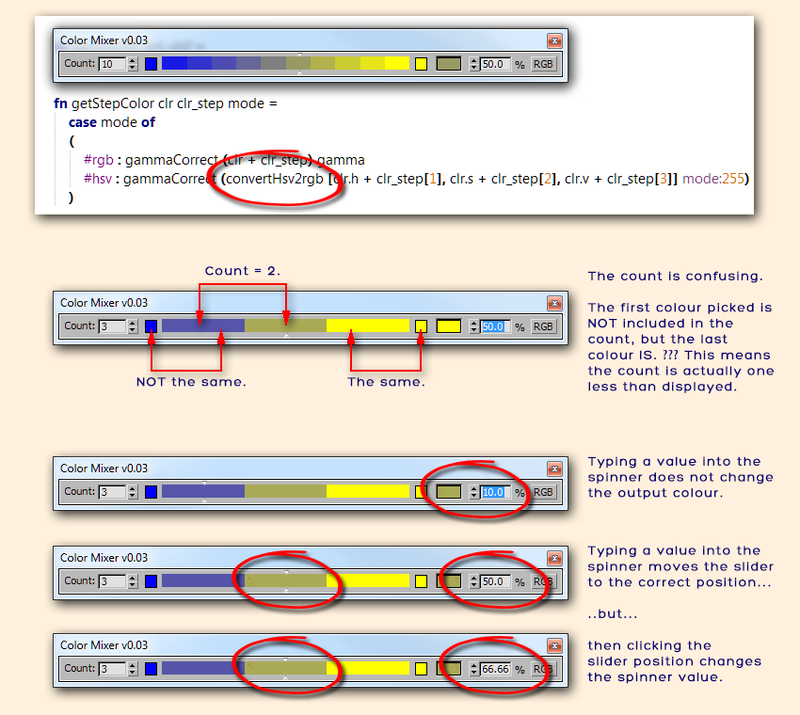 The two source colors and the resulting blend color are colorpickers and as such you can right-click them and copy/paste their values. Works in newer max version now. Right-clicking the bar gives option to copy color code to clipboard (RGB, HEX, HSB, OLE, approx. CMYK). Fixed a few bugs, including double gamma. Thanks to MrTom and obaida for pointing out the issues. Colors are now gamma corrected. Added HSV/RGB color space switcher. Submitted by Swordslayer on Sat, 2013-12-21 15:05. Cool, thanks for spotting that :) I've included that bit in the refactored version, if you spot any other problem/oversight, don't hesistate to let me know, I really value that. Submitted by MrTom on Sat, 2013-12-14 17:54. Thanks for updating this, appreciated. I wonder though if this code seems a little redundant maybe? It kind of says, "when I'm changed, change me again"
Submitted by MrTom on Fri, 2013-10-18 01:54. Is this correct? It seems to work ok. I did find a couple more [ minor ] issues though in the process, see image for details. Submitted by MrTom on Thu, 2013-10-17 16:34. Ran the .ms script from editor...all fine until I click the HSV button. 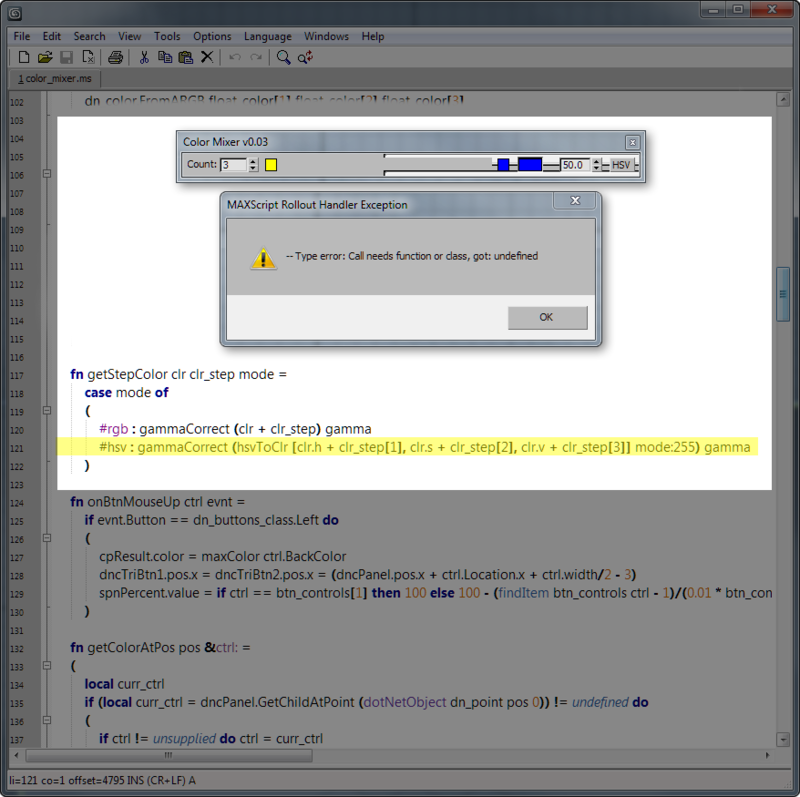 The image shows the error produced. I acknowledged the error and closed the rollout. Ran the script again and the same error occurred instantly. Closed Max and re-opened, ran script again....instant error again. Submitted by obaida on Thu, 2013-10-17 13:47.
another issue here ! the (result color) has bouble gamma !? Submitted by obaida on Thu, 2013-10-17 11:39.
its working fine now , thank you for quick replay . Submitted by Swordslayer on Thu, 2013-10-17 06:01. Thanks for using it, I've updated the script to handle gamma correction. Submitted by obaida on Thu, 2013-10-17 04:04. Thank you for this script , I noticed that the color in slider bar have gamma 1.0 even if the gamma set to 2.2 !!? so , any fix for this issue . Submitted by Script_Butler on Wed, 2011-08-31 07:45. Thanks for sorting it asap. Submitted by Swordslayer on Wed, 2011-08-31 03:29. Thanks for input, I will look into it ASAP.